Americans are living longer, healthier, and more active lives than past generations, and they want to ensure their healthcare and domestic needs are met. That means saving for a longer retirement is critical. Everyone has different circumstances. For example, how would you like to live? 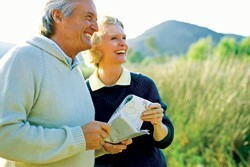 When should you retire? How much should you save? Start thinking about retirement by assessing what you think you'll need and what you want. An oft-cited estimate is that you'll need 85% of your pre-retirement annual income when you enter retirement, but there are many factors to consider in determining how much you should save and how much you'll spend. At what age do you hope to retire? Will you have mortgage or rent payments? Do you have any health concerns requiring medication or ongoing treatment? Do you plan to move somewhere that's either more or less expensive than your current standard of living? How much would you like to spend on hobbies, activities, or bucket-list items? Do you anticipate having any large expenses between now and retirement, such as buying a home or funding a child's education? Do you want to leave assets to your children? However, not everyone may feel they have the time or self-assurance to navigate their retirement options and make those choices. Fortunately, a diverse array of options is available to address your individual needs and aspirations. The benefits and limitations of various investment vehicles—such as tax implications, distribution requirements, and the amount of risk entailed— should all be assessed when deciding how to construct your retirement foundation. A financial consultant can help you determine which vehicle or combination of investments is most appropriate for your unique goals and circumstances. Traditional, Roth, and rollover IRAs each have their own advantages as well as certain restrictions. While traditional IRAs often allow tax-deductible contributions and offer tax-deferred earnings, Roth IRAs are funded with after-tax dollars and allow earnings to be withdrawn tax free after age 59 and a half, provided the account has been open for at least five years. Both allow annual contributions set by the IRS and make available a broad range of investment vehicle choices. Plus, both traditional and Roth IRAs offer a certain degree of flexibility in case you need to interrupt your savings for specified expenses, such as purchasing a first home or funding a child's education. Rollover accounts, a more specialized option, are used strictly to convert funds from qualified retirement or pension plans without assuming current tax liability. With so many choices, choosing the right IRA for your needs takes careful research and consideration. Even when investing through your employer, the advice of a financial consultant can be invaluable in making crucial plan decisions, and ensuring these investments and your other retirement savings match your broader goals while minimizing portfolio overlap and achieving optimal diversification. Beyond these services, your financial consultant can also help make certain the amounts you are contributing to the savings vehicles you choose are appropriate for both your current financial situation and your longterm goals. As the earliest baby boomers begin to enter retirement, the various income guarantees and other living benefits offered through variable annuities (VAs) are gaining in importance. Yet before you rush to add a VA to your retirement funding scheme, take some time to understand what VAs have to offer in a general sense and to sort through the host of optional features and their associated fees and investment risks. The Securities and Exchange Commission defines a VA as "a contract between you and an insurance company, under which the insurer agrees to make periodic payments to you, beginning either immediately or at some future date.” You can purchase a VA by making a single purchase payment or a series of payments spread out over a period of time. The "variable" modifier denotes that the value of your VA will vary depending on the performance of the underlying investments you choose when contributing to and managing your account. Most VAs offer a menu of subaccounts that, similar to defined contribution plan options, invest in different styles of stocks, bonds, and money market instruments.2 Therefore, VAs could lose value. VAs are used mainly to supplement more traditional sources of retirement income such as Social Security and pension plans. Speak with your financial planner to learn about common features and, for an additional fee, optional principal protection benefits referred collectively as living benefit options. Risk is an unavoidable part of investing. Historically, investments with higher return potential have required a higher tolerance for risk. Therefore, by clearly defining your risk tolerance, we'll be better prepared to choose the most appropriate investments for your portfolio. Over time, your goals and financial situation may change. It's important for us to discuss any changes, as your original investment objective may need to be re-evaluated. The most important thing you can do to help secure a financial future that aligns with your goals is to begin planning today. Your financial planner can help you get started with a free, no-obligation appointment. 1Variable annuities are long-term, tax-deferred investment vehicles designed for retirement purposes and contain both an investment and insurance component. They are sold only by prospectus. Guarantees are based on the claimspaying ability of the issuer and do not apply to a variable annuity's separate account or its underlying investments. The investment returns and principal value of the available subaccount portfolios will fluctuate so that the value of an investor's unit, when redeemed, may be worth more or less than their original value. Withdrawals made prior to age 59 and a half may be subject to a 10% additional tax. Surrender charges may apply. Gains from tax-deferred investments are taxable as ordinary income upon withdrawal. 2An investment in a money market fund is not insured or guaranteed by the Federal Deposit Insurance Corporation or any other government agency. Although a money market fund seeks to preserve the value of your investment at $1.00 per share, it is possible to lose money by investing in the fund. 3All living benefits are available for an additional cost. The guarantees associated with living benefits are backed by the claims-paying ability of the issuing insurance company. It is important to weigh the costs against the benefits when adding such options to an annuity contract.